Chinese President Xi Jinping is received by Sheikh Mohammed bin Rashid Al Maktoum, vice president of the United Arab Emirates, after his arrival in Abu Dhabi, July 19, 2018 (Photo by Mohamed Al Hammadi for Emirates News Agency via AP Images). 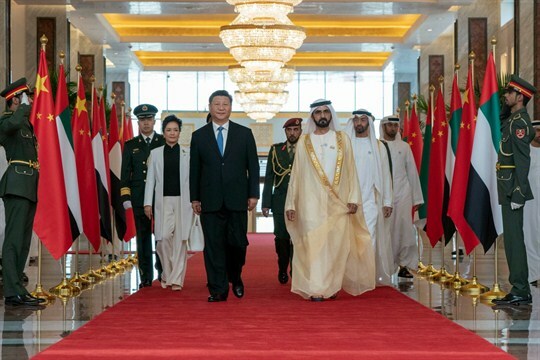 As dusk fell in Abu Dhabi on July 20, the LED screen affixed to the face of the 65-story headquarters of the emirate’s national oil company presented a peculiar sight: a photograph of Chinese President Xi Jinping stretching over 1,000 feet high, looming over the Persian Gulf. In nearby Dubai, the Burj Khalifa, the world’s tallest skyscraper, was lit from top to bottom in the colors of the Chinese flag. Even by the standards of a country with little use for subtlety, the United Arab Emirates went all out to mark Xi’s state visit.